My Bender App Data & Review - Productivity - Apps Rankings! Is that three bend saddle at the end of the pipe? Don't you wish you could flip the bender around to make the bend easier? My Bender has your back. 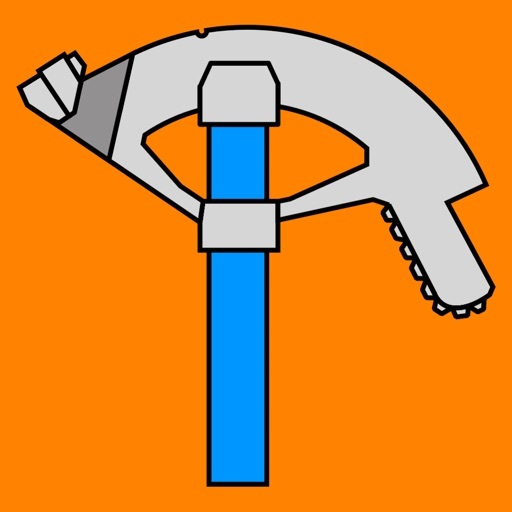 One of the key features is My Bender's ability to allow you to orient the bender to make your bending more practical, just tap on the bender to flip the orientation of the bender. 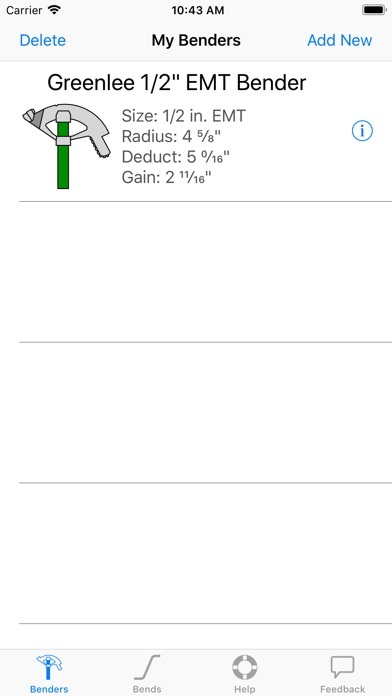 My Bender, offers the most accurate conduit bending calculations on the App Store. How? Because My Bender uses "your" bender, with its unique bending characteristics to do the math. Most other calculators use the cosecant method which is simply an approximation, or a rule of thumb. But as pipe size and bend angle increase in size, the error introduced with the approximation also increases. This is because the benders' radius and pipe diameter are not taken into consideration, this is not the case with My Bender. -Offsets with predetermined locations on the conduit. -Match an existing offset's angle. -Three Bend saddles that fit like a glove. 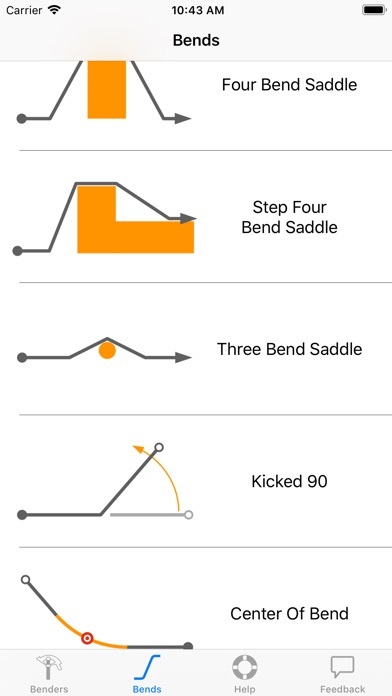 -Four Bend saddles that "look like they grew there". -Kicked 90° Bend that will make your heart skip a beat. 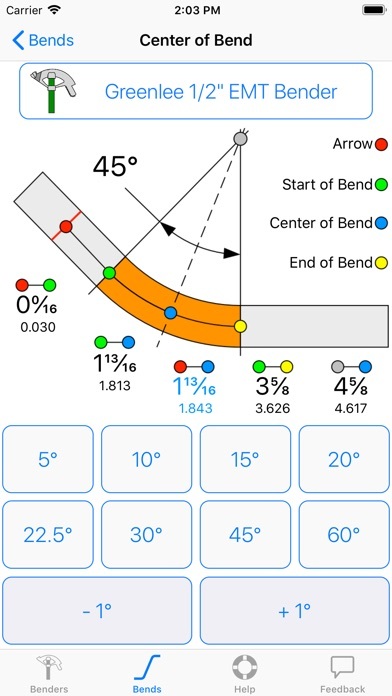 -Calculate the distance from your benchmark to the center of bend for any angle. 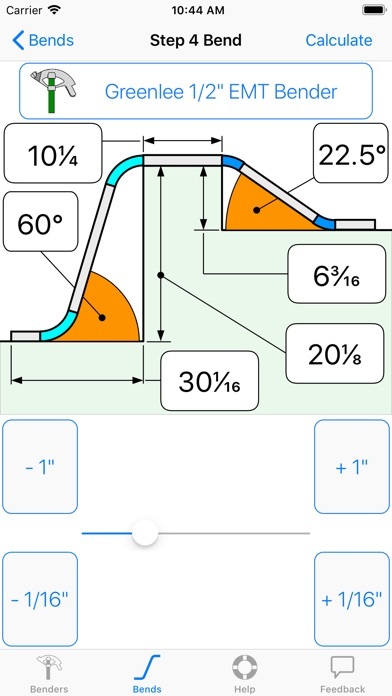 There are other conduit bending calculators on the App store, but none have the polish and attention to detail that My Bender has. 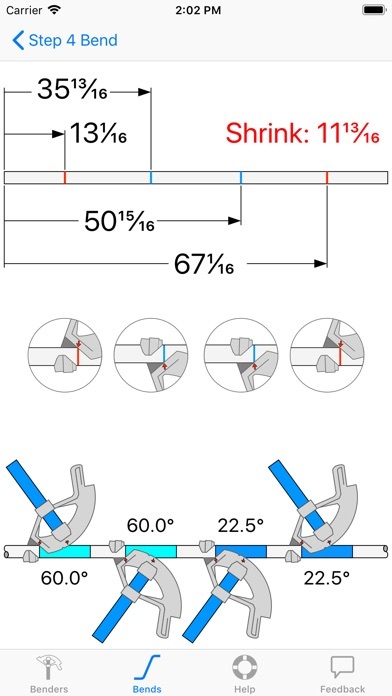 My Bender allows you to "flip" the orientation of the bender to best suit practical bending, and then shows you the correct measurement for the benders current orientation. 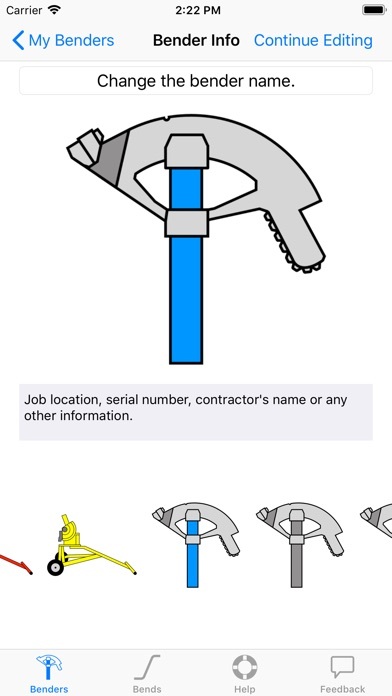 My Bender helps the professional electrician keep track of all the conduit benders he uses. As you know every bender has its own bending characteristics. In order to account for these differences in benders it is necessary to have a log book where the bender's details are kept. How does My Bender calculate this? Everything is based on the centerline bending radius. This is calculated by bending one 90° bend and making some key measurements. You select the pipe size and material. And that is all it takes for My Bender to "fingerprint" your bender. Every key measurement also has a description page that uses diagrams to help you visualize the measurement. The applications My Bender was published in the category Productivity on 2010-12-14 and was developed by Francisco Alcala. The file size is 29.42 MB. The current version is 3.7 and works well on 10.3 and high ios versions. Do you like My Bender applications? Please share! Developer will not update to iOS11. It won’t even open. Thanks for nothing! After easy setup this app is dead nuts on. Wish I would have had looked closer. FUTURE UPDATES. I bought the app thinking it would do all that now. Now is when I need some of those features. Not a complete waste unless I buy something that does what this does now to. Back to the App Store. Maybe I will like the app better when and if its updated. This app is the best I tried so far.